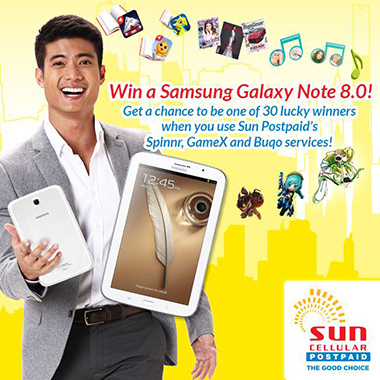 Good news to our Sun Postpaid subscribers, here’s your chance to be one of the 30 lucky winners of Samsung Note 8.0 by joining Sun Postpaid’s Win a Samsung Galaxy Note 8.0 Promo! To join, avail any of the following services worth at least P49 from Spinnr, Buqo App, E-Pin through the GameX web portal or a Java Game by through Gameloft Shop and earn a one (1) raffle entry. The more you avail the following services, gets additional raffle entries and the more chances of winning. Promo still runs from April 8 – May 8, 2015. Join now! Permit DTI-FTEB SPD Permit no. 6261, Series of 2015. You can visit www.suncellular.com.ph and Sun Cellular Facebook page for more details. Visit us again at www.unlipromo.com and UnliPromo FB page for latest promos, discounts, contest and freebies.